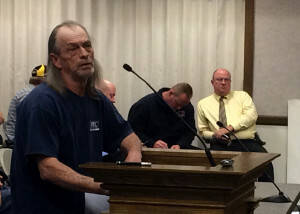 CEDAR CITY — An ordinance requiring an immediate 6-month moratorium on the issuance of a business license to any tobacco specialty store currently looking to open shop within city limits was considered in Wednesday night’s City Council meeting. The ordinance was brought to the table by Cedar City Attorney Paul Bittmenn after a Feb. 3 presentation to the City Council by the Iron County Prevention Coalition shed some light on the potential dangers e-cigarettes pose to community youth. The prevention coalition is an organization that examines data to identify and prevent potential problems. The six months would allow time for City Council and administrators to properly research the issue, according to the ordinance. Since the city established its 2013 ordinance regarding the purchase of a business license for specialty tobacco stores, there are legislative changes that have yet to be added to the city’s ordinance. Additionally, the ordinance stated there is new legislation related to age limits for tobacco sales under consideration by state legislators this year that may contribute to the upcoming ordinance revisions. Along with consideration for the state requirements, the ordinance stated city officials have a special interest in including provisions in the code to regulate e-cigarette sales within city limits. Based on the prevention coalition’s presentation, recent trends have shown an up curve of minors using the controversial contraptions. The coalition suggested that as a preventative measure, City Council members should consider a potential ban on the opening of new specialty smoke shops in the future. During the meeting coalition members disclosed that a local student health and risk prevention survey yielded disturbing results when it came to e-cigarette use and Cedar City youth. In Iron County there are a total of 42 retail outlets including gas stations, grocery stores and specialty shops that sell tobacco and e-cigarette product to service a population of roughly 47,000. Of the 42 venues, 33 of them reside within the Cedar City limits — four of those are tobacco specialty shops. D&D Smokes and More owner Kevin Davis expressed to council members and city administrators that the newly suggested ordinance was of grave concern to him and his livelihood. It wasn’t the idea of the moratorium as applied to new licenses that bothered him, he said, it was that if he were to gain enough capital to build his own shop he would be subject to the moratorium as well. As a lessee he is subject to the whims of a landlord who may one day decide not to renew their contract for reasons of his own. If that were to happen, Davis said, he would be left with a considerable loss waiting an entire 6-month period before he could open his store once again. “I already have a business license,” he said. “My landlord could say, ‘your lease is up and I’m not going to renew your lease,’ and then what would I do? “You’d put me out of business, and I bring a lot of revenue into the city and the state,” Davis added. Council and administrators agreed that there were some valid points raised and that there should be more discussion about how the moratorium would impact existing businesses before passing it during next week’s action meeting. I don’t see what the problem is. Most the research out there has been discredited, and some would say purposely to mislead people on the real dangers of vaping. For example, the one saying that at certain voltages that formaldehyde is released at dangerous levels. Was misleading not because it was wrong, but because nobody in a real world scenario would ever vape that high, because he couldn’t stand the smoke and the taste. Most vapers, vape at way below those levels. The other think I might point out is the Britsh Government has deemed that e-cigarettes are 95%, So maybe St. Gerorge out to just ban cigarettes? Vaping is far safer so why all the concern. I think it’s because people haven’t been properly educated on the real risk. Despite, what people have said there are a lot more studies out there than is commonly believed going off what the media is putting out there. I’d go as far as saying the big pharma and big tobacco, sees e-cigarettes as a threat to their business. Another misconception is the Big Tobacco is behind vaping, far from it about 97% of vaping products aren’t even put out by big tobacco, and a lot of it comes from small mom and pop stores. Big tobacco makes up around 3% of the market. For every study you’ve seen on the dangers of e-cigarettes it’s be nice if people looked at what the other side has to say because a lot of dangers are based on those studies being mischaracterized or misunderstood by the media to make it look as there is this big danger. Many studies are out right junk science and put out there purely propaganda reasons, by those with uterior motives for wanting the public to perceive e-cigarettes as dangerous Like I said, a whole country the UK says e-cigarettes are 95% google it. So what is the big problem?